As we enter our third year (can you believe it? ), we are delighted to share our list of dream locations for night photography workshops in the U.S. and abroad in 2018. In 2018, we continue to present two kinds of learning experiences: Passport Series and Adventure Series workshops. At Passport Series workshops, we take you to a national park and teach to the landscape, sky and celestial events. At Adventure Series workshops, we take you to other interesting natural wonders that may be on or near national and/or protected lands, perhaps during singular events (like a solar eclipse), sometimes focusing a little less on instruction and more on field time, exploring and creativity, or sometimes focusing on advanced night photography techniques. We’re also offering some cool options this year. The Biscayne and Redwood workshops will include a coordinated gallery show with both national park offices. Tim and I will be offering night portraiture classes at our headquarters in Catskill, New York. Chris and Gabe will take you on a road trip along the Blue Ridge Parkway on our most mobile workshop yet. Lance and I will take you to a sacred space for a light painting intensive camping workshop. And Gabe and Chris are offering a black-and-white light painting workshop at a steamy industrial space. Join us for the gently moon-kissed cliffs, canyons, domes and bridges of the classic Utah red-rock Waterpocket Fold. From the lush orchards of Fruita to the rich geological history within Navajo Sandstone, we’ll explore the deep skies of this Gold-Tier Dark Sky Park. This northwestern Montana park contains some of the most wild and diverse ecosystems in the country. 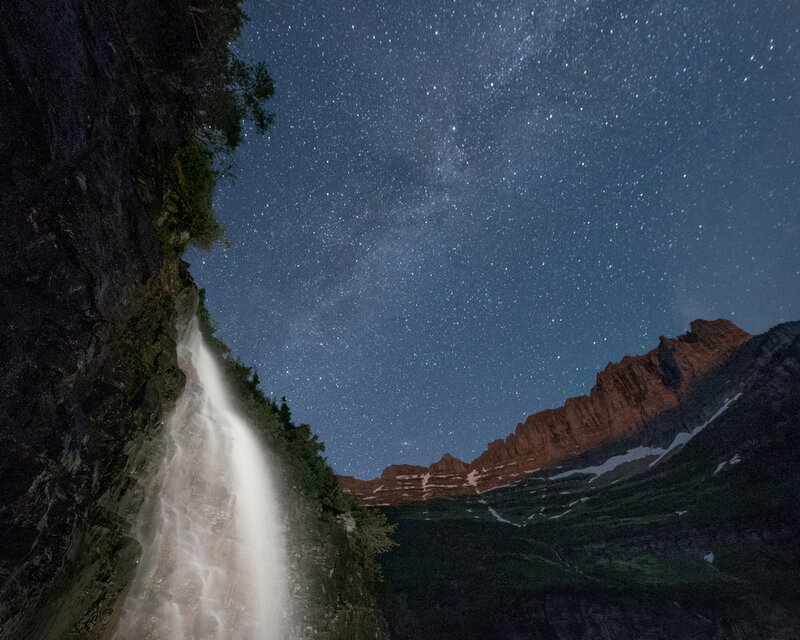 Waterfalls, subalpine tundra, soaring rocky mountain peaks, high plains and crystal-clear rivers create breathtaking foregrounds for our night skies. Redwood National and State Parks is composed of three distinct environments—a rocky coastline with steep cliffs and the ubiquitous coastal fog, upland prairies, and of course the magnificent redwood forests that give the park its name. During this workshop, you’ll have the opportunity to develop your night photography skills in all three. Within the wilds of Rocky Mountain National Park lie alpine lakes, boulder-strewn tundra, aspen groves that turn gold in fall, and a Milky Way so radiant that you’ll feel you could reach to the sky and brush it with your fingertips. We will venture together into the mountains to photograph all this and more, in one of the most wondrous landscapes in all the national parks. The night is falling, and the road is calling. And we will be there, driving and photographing America’s greatest scenic byway. 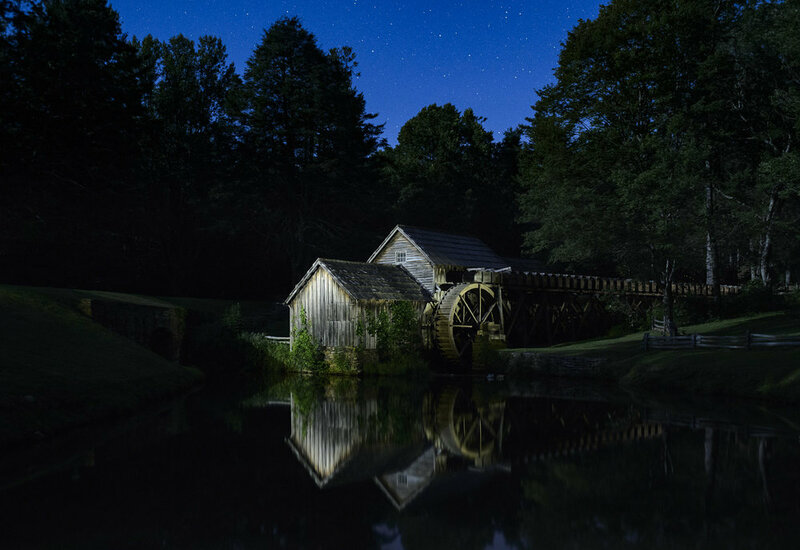 When the sun fades, we’ll bring our cameras along the 469-mile ribbon of national parkland that stretches atop mountain ridges, through farming communities, past historic cabins and mills, alongside meadows and more, while the stars and moon gently shine on the great blacktop river called Blue Ridge Parkway. Master the fundamentals of night portraiture. Mash up night photography with classical portrait lighting to create dramatic long exposure portraits. Unleash your creativity. The Ancestral Puebloan ruins at Chaco Canyon are the centerpiece of Chaco Culture National Historical Park, and are also a UNESCO World Heritage Site. The park was also designated as Gold Tier by the International Dark-Sky Association in 2013. Who could ask for more from a night photography location? National Parks at Night aims to do just that. In addition to having rare nighttime access to photograph the park, we will have a ranger-led tour and meet with others with deep knowledge of the Puebloan people and the ruins on New Mexico. This is a full-immersion experience. This photo tour will take us along the famous south coast of Iceland, where we will experience the capital city of Reykjavik, bizarre geothermal landscapes, magnificent waterfalls, glacial lagoons, an ice cave, and, with luck, the northern lights. 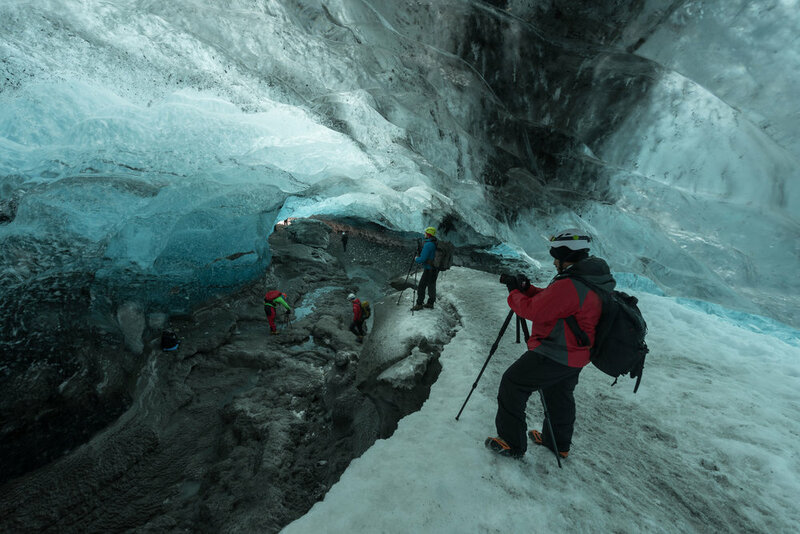 Iceland has seen a huge surge in tourism in recent years, and we will strive to find a balance between getting you to the most important locations, but also some off-the-beaten-path places that are much less visited but equally as interesting. Come explore and photograph some of Scotland’s most interesting places and dramatic landscapes on this first of National Parks at Night’s photo tours of the islands of Scotland. The Hebrides are a widespread and diverse archipelago off the west coast of the mainland. The culture of the residents has been affected by the successive influences of Celtic-, Norse- and English-speaking peoples. We will spend our time on the largest of the inner Hebrides, the Isle of Skye, and the largest of the outer Hebrides, Lewis and Harris. The history of these islands is ever-present in the landscape in the form of Neolithic, Mesolithic and Iron Age archaeological sites. We will explore cultures past and present along with the stunningly diverse landscapes we’ll encounter along the way. 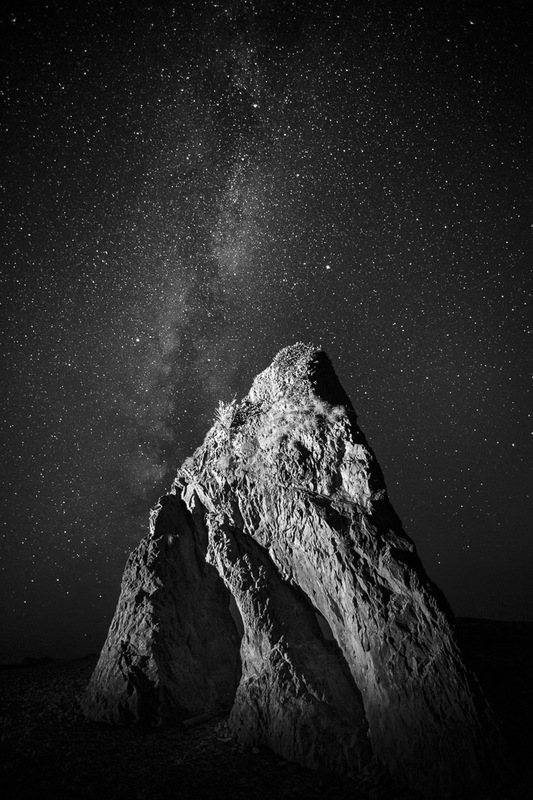 The focus of this night photography workshop will be a deep dive into light painting, composition, and black and white photography. Sloss Furnaces National Historic Landmark is an incredible hulk of 20th century metal machinery located on the eastern edge of downtown Birmingham, Alabama. Don’t expect to see many stars in the city, however we will use moonlight and light painting to breathe fire back into the furnaces. Don't Want to Wait for 2018? If you'd like to come with us on a workshop even sooner, we have great news: We opened up a second week at Olympic National Park next month: September 24-29, 2017. Join Chris Nicholson and Matt Hill on the rugged mountains, in the vibrant rainforests and along the pristine coastline of Washington state’s Olympic Peninsula, in one of the most beautiful and diverse national parks in the U.S. Finally, as we embark on our third year, we’d like to express thanks to all our alumni—the 200 fine photographers who have accompanied us over the past two years to wonderful night photography locations such as Acadia, Dry Tortugas, Death Valley, Zion, Great Sand Dunes, Cape Cod, Centennial Valley and more. We appreciate you so very much. Do you want to see their work? Check out this playlist of all the workshop slideshows. If you’re any kind of national park fan, you have almost certainly seen the work of Jacob W. Frank. It is ubiquitous—and excellent. Part of Jacob’s not-so-secret approach is that he has one of the best tools a photographer can possess: constant access. His intimate knowledge of his subject comes from having what many of us would consider a dream job—he’s a photographer who works as a park ranger, currently at Montana's Glacier National Park. Moreover, some of Jacob’s best-known photos were shot at night, including a superb series of work he created under the pristine skies of Arches National Park and other red-rock hot spots on the Colorado Plateau. Perhaps his most famous image is of Delicate Arch being lit by a headlamp under a stunning Milky Way sky, a photograph that exquisitely portrays the night experience of the western national parks. Delicate Arch, Arches National Park. NPS Photo by Jacob W. Frank. Jacob's photo work spans many gems of the park system, including Yellowstone, Yosemite, Grand Canyon, Bryce Canyon, Canyonlands, Death Valley, Carlsbad Caverns, Hawaii Volcanoes, Olympic, Kenai Fjords, Mesa Verde, Saguaro, Rocky Mountain, Black Canyon of the Gunnison ... and the list goes on, and on, and on.... Some of this work has been exhibited, most notably in the Smithsonian. I spoke recently with Jacob about how he got his amazing job, his favorite photography gear, and his thoughts about doing night photography in our national parks. Chris: How did you become a national park photographer? I would get lots of visitor questions: “What is this thing that we’re looking at?”—“What is that bird?”—“What mountain is that?” I didn’t have any idea, so I would take a picture, figure out the answers and e-mail people—and that’s how I learned and what got me interested in nature. Then after a while, I was thinking things like, “Oh, I already have a picture of that bird but I want to try to get a better one.” Once I started knowing what things were, I didn’t need to take pictures to figure them out, but rather I found myself trying to get better photos. Now I really enjoy photography. It pushes me to go out sometimes when I wouldn’t otherwise. I’m not about hiking just for the fun of hiking—hiking is what you have to do to get good photos or to get to the top of the mountain. I just really love capturing photos. There’s an intrinsic value for me of just getting really good photos, and then it just happens to be that other people enjoy the work that I do. Chris: What cameras do you use? Jacob: I have a Canon 5D Mark III, which is pretty much my main camera now. I just recently got rid of a 7D that I had been using for wildlife photography. Chris: What’s your favorite piece of non-camera photography gear? Jacob: My Peak Design camera clip for my backpack has been a game-changer. Backpacking, hiking and climbing with a camera can be challenging. You want to have your camera accessible but putting a strap over your shoulder or neck isn’t comfortable or secure. Their Capture clip solved that problem. I find myself taking more photos and capturing better photos because I always have my camera at the ready. Owachomo Bridge, Natural Bridges National Monument. NPS Photo by Jacob W. Frank. Chris: What’s your favorite lens for night photography? Jacob: I’ve used a variety of them. Right now I have the Rokinon 14mm f/2.8, and I mainly use that. Probably down the road I’ll get the 24mm f/1.4. I’ve used that one also and I really like it. Also, I had the Canon 16-35mm f/2.8, and the Sigma 20mm f/1.4. I’ve gotten great photos from all of them, but when you’re doing night photography, I find my lens setup changes based on what park I’m in. For some parks you need just a superwide angle, and don’t really need a lot of zoom. For example, in Glacier the 16-35mm was too wide for most times, unless you were on top of a mountain. Often I felt like I wanted a little bit more reach, so now I shoot with the 24-105mm a lot. But that’s not fast enough for night photography, so I sold my 16-35mm and got the Rokinon. I try to not have specialty lenses, like a one-trick pony, but I really like that Rokinon for night photography, and the 14mm is super sharp. Chris: What is it about a park that changes the type of lenses you’re using? Jacob: In some parks, you’re really in the park. For instance, when you’re in Arches National Park, you’re in tight spots—you’re either inside an arch or the arch is really close to you. You’re maneuvering through a squeeze or you’re hiking on some sort of a slick rock. Whatever it is, you’re in the resource and the landscape almost becomes the foreground because you’re so close to it—you’re in it. So having a superwide angle is really helpful. Turret Arch, Arches National Park. NPS Photo by Jacob W. Frank. On the other hand, when you’re in a big mountain park, with huge mountains far away, you can be on the mountains but there’s still a lot to see for a long distance. Having too wide of an angle diminishes the grandeur of where you are; it doesn’t portray how big and how vast everything is. You can still get those shots—I still use a superwide angle—but a lot of times you need to zoom in and capture the detail of how big a park is. Telephoto is also good for when you’re hiking around on the trails, for having the ability to zoom in and add a person to give the photo some scale. I decided to switch from the 16-36mm to the 24-105mm after I did a detail to Alaska last summer. I went to Wrangell St. Elias National Park, and that is the ultimate park of grandeur. Everything was so big and I found myself wanting to zoom in on details, but was unable to without having to have carry separate setup. I really like the style and the ability to zoom in on particular mountains. I’ve been doing a portrait series of mountains this summer during sunrise or sunset. There are a lot of cool peaks that you can focus on using the 100mm and 150mm range. I’ve been calling it a “Mountain Portrait Project”—just taking lots of cool pictures of individual mountains in the portrait orientation. It’s been fun and people seem to like it. Chris: Do you have a favorite night photography technique? Jacob: I got into night photography because of the aurora in Alaska. When I lived up there I shot a ton of aurora. It’s the coolest natural phenomenon there is, no matter how many times you see it. Aurora Borealis at Glacier National Park. NPS Photo by Jacob W. Frank. I got into Milky Way photography because of how much fun I had at night shooting the aurora. When I came down to the Lower 48, I moved to the Colorado Plateau, which is known for its night sky. I already knew how to shoot night stuff from Alaska, so it was a natural progression to start shooting the Milky Way. I do like shooting the Milky Way, but a lot of it requires good camera technique. The majority of what people see nowadays aren’t even single images—they’re blended multiple images. Your average everyday person can’t take a photo like that without studying and really upping their post-processing skills. Good aurora photos require the same technique, but the average everyday person can point their camera, push a button, the aurora is going to pop out and they are going to be amazed with it. Chris: What are your favorite national parks for night photography? Jacob: Alaska parks for aurora, but aurora works only in the spring, fall and winter. In the summertime, the sky doesn’t get dark enough. Aurora, Denali National Park. NPS Photo by Jacob W. Frank. 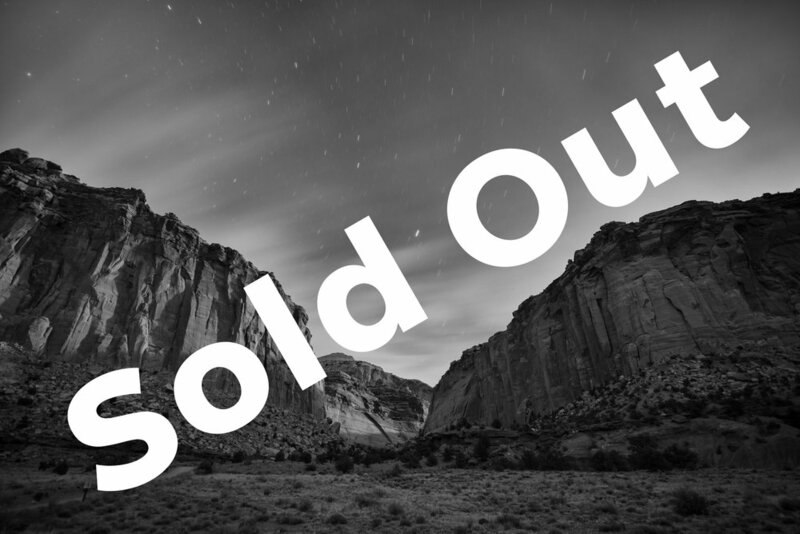 For dark sky parks for shooting the Milky Way, I’ve had a blast shooting in Arches, and I’ve had a blast shooting in Capitol Reef National Park and in Natural Bridges National Monument. Hovenweep National Monument and Dinosaur National Monument have really dark skies, as does Great Sand Dunes National Park. I actually I saw northern lights when I was in Great Sand Dunes. They have really cool dark night skies. Chris: You saw northern lights that far south? Then I’m looking at the image and I said, “Wait a second, those mountains are 14,000 feet tall and I don’t think there’s anything north of them nearby." I thought that was kind of weird, so I started time-lapsing and I noticed that the sky glow started moving and started getting pillars in it. I realized, “Oh, this is northern lights!” When we went back to the car, we got cell service and looked it up on Spaceweather.com—and it was a geomagnetic storm of like 7! So we were getting the southern end of the aurora storm. Chris: What’s next for you? Are you working on any other specific projects? In December, the plan is to go out and speak about the Centennial. Other than that, I’m just working in the park. Then when I’m not working, I’m traveling to other parks, just being outdoors. To see more of Jacob's photography, and to read about his adventures photographing the national parks, visit www.jwfrank.com. He is also on Flickr and Instagram. Visiting our National Parks with a little foreknowledge is the best way to ensure your chances of coming home with great photographs. Being in the right place at the right time is rarely an accident. Foreknowledge is also the recipe for making your images stand out from the millions of other photos taken in these dramatic locations. Photographers should take the time to do some “virtual” scouting. Begin with a Google search of the name of the park you are planning to visit. At the top of the resulting screen you’ll find filters to adjust what content is displayed on the page. Click on “Images” to be rewarded with a page full of photos in and around the park. While not all of the photos will be masterpieces, they will give you a great idea of the locations of the more popular viewpoints and places of interest. Clicking on an image opens it to a larger view and supplies the link to the image. You’ll often find the name of the location or feature right here. If not, click on the link to discover more information about the image. Take some time with this process and create a list of all possible locations you’d like to visit. Some of the places you may want to shoot might be inconvenient, closed for the season or farther than you would like hike. Next, find a map! Google Maps is a great resource, as are the official National Park maps that can be found at www.nps.gov. Once you locate the desired sights on the map, you can better assess the best time of day or night to be there. Knowing the exact direction you want to face makes it easier to find south-facing mountains for star trails around the North Star, east-facing objects for sunrise, and west-facing scenes for sunset. Making a list of possible scenes and locating them on the map is the least anyone should do before visiting a national park for photography. For those who leave nothing to chance, there are plenty of websites, computer applications and smartphone apps that can assist in exact sun angles and rise and set times, direction of moon rises and even when it will rise above a land formation. A couple of my favorites are PhotoPills and Google Earth. PhotoPills is a great iPhone app that can do just about everything — planning your Milky Way shots, calculating depth of field, discovering the start time of astronomical twilight, or even discovering exactly when and where the moon will rise over the nearby peaks. It’s a must-have for any photographer who uses an iPhone. By phone app standards it’s a bit pricey ($9.99), but well worth every penny. Google Earth is another indispensable, content-rich application for your computer and iOS or Android phone. Using Google Earth you can get an excellent lay of the land you plan to visit. By using the controls in the upper right, you can not only zoom in and around but also tilt to get a reasonable idea of the land formations. For those looking for a less technical experience, Sun Seeker, Night Sky and Moon Seeker are three apps that are quite useful … and free! Recently Chris Nicholson talked with astronomer Tyler Nordgren about why he loves the parks, reasons they’re so great for night photography, upcoming celestial events we should all want to photograph, and more.